The firm is a wholly owned subsidiary of Vard Group AS. VARD focuses on the design of complex vessels, including offshore service, research, coastal patrol, and offshore patrol vessels, as well as other commercial or government ships. The company has a broad experience in all aspects of ship design including specialised analyses, such as computational fluid dynamics, seakeeping analysis, and finite element analysis. VARD uses a sound commercial approach to patrol vessel design, using well-proven off-the-shelf materials and equipment. Almost all hull forms have been extensively model-tested and full scale data has been used to correlate the tow tank results and computational fluid dynamics (CFD) analysis to ensure the accuracy of performance predictions. The hull forms are typically larger than equivalent size naval combatant platforms which offer greater internal volume to reduce construction cost and offer a higher level of crew comfort and safety, all without compromising speed performance. The designs developed by VARD are principally aimed at economic zone patrol duties served by a country’s navy, coast guard or other defense authority. For patrol duties in coastal or brown water locations, VARD have designs ranging from the 7 045 and 7 050 up to the helicopter-capable 7 062. These designs are based on proven hull forms and are capable of speeds in the range of 20kn to 25kn, and in excess of 30kn for the 7 062. For loiter duties, the designs are outfitted with either a drop-down electric driven propulsor or an integrated diesel or electric drive of the main propellers. VARD, as part of the Eastern Shipbuilding Team, was down-selected by USCG to design a vessel for the USCG offshore patrol cutter programme. This effort will result in a new highly capable design in excess of 105m that has a significant suite of combat weapons and support systems, and meets the high standards of the ABS naval vessel rules. Most recently, the first of three vessels of the VARD 7 090 design was delivered from Appledore Shipyard in Devon, UK. These 90m, 23-knot, vessels are the second-generation patrol vessels based on the successful 7 080 series built at the same shipyard twelve years earlier. The 7 085 was a two-vessel contract to design offshore patrol vessels for the Royal New Zealand Navy at the BAE Systems Australia shipyard in Williamstown, Victoria. This design offers a 23-knot maximum speed with full helicopter facilities, including maintenance hangar and refueling capability. The vessel has a range of 6,000 nautical miles and is also ice-strengthened for patrol duties in the Antarctic regions. 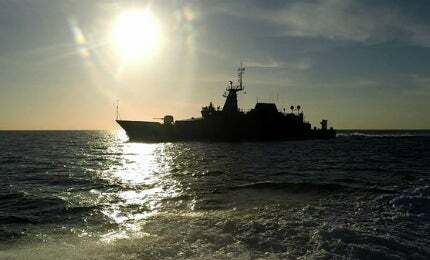 Two vessels were built to the 7 080 design at Appledore Shipyard in Devon, UK for the Irish naval service. The designs were a further development of the 7 075 and have a maximum speed in excess of 22kn and a range of 6,000 nautical miles. They operate in the harsh environments of the North Atlantic and the Irish Sea. These vessels were also the first VARD design to include segregated machinery spaces for added safety and redundancy. VARD procured all equipment and provided project management and on-site supervision during the construction and post-delivery logistics and training support in Mauritius. VARD is continually working to develop new vessels and to improve the efficiency and flexibility of all (offshore patrol vessel) OPV designs. This includes the incorporation of the latest hybrid propulsion systems for slow-speed operations, the use of the latest technology for mission systems such as unmanned aerial vehicles (UAVs) and unmanned service vehicles (USVs), and the harmonisation of the structure for modular construction techniques and pre-outfitting. Mainboard-listed Vard Holdings announced yesterday that a design developed by its subsidiary, Vard Marine, has been selected for the US Coast Guard's new offshore patrol cutter (OPC) programme. Take a glimpe at a VARD marine vessel in action. HMS Defender is the fifth destroyer vessel of the Royal Navy's Type 45 Class Destroyers. It is also the largest and most powerful destroyer in the navy's fleet. STX Marine is pleased to announce their attendance and sponsorship at the 7th annual Offshore Patrol Vessels conference held on September 25-27 in Amsterdam, The Netherlands. STX Marine is pleased to report the keel-laying of the first of two Offshore Patrol Vessels (OPVs) for the Irish Naval Service (INS). STX Marine is pleased to announce their attendance and sponsorship at the 2012 Offshore Patrol Vessels Latin America conference held on May 21-22 at the Centro de Convenções Bolsa do Rio in Rio de Janeiro, Brazil. STX Marine is pleased to announce that we will be exhibiting at IMDEX Asia 2011 at the Changi Exhibition Centre in Singapore on 18-20 May. On display will be our new PV95 design, together with information on our current OPV projects. Please come and visit us at booth Q18.